A concrete mixer (often mistakenly called a cement mixer) is a device that homogeneously combines cement , aggregate such as sand or gravel, and water to form concrete. Today’s market increasingly requires consistent homogeneity and short mixing times for the industrial production of ready-mix concrete, and more so for precast/prestressed concrete. This has resulted in refinement of mixing technologies for concrete production. JS concrete mixer is a kind of forced concrete mixer with higher production efficiency. JS small concrete mixer is forced and double shaft mixer, and its mixing performance is good. Therefore, JS concrete mixer applies not only to small and medium-sized construction projects and commercial concrete mixing station, also suitable for mixing aggregate engineering of casting technology of less than 120 mm. Zhengzhou CamelWay Machinery manufacture is one of the large-scale enterprise specializing in construction machinery. The company was found in 1983. 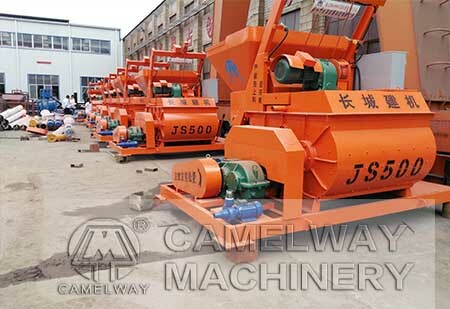 CamelWay Machinery manufacture develops and produces concrete mixer which will satisfy your different requirements. There are 0.5cube type of mixer, 0.75 cube type of forced mixer, 1 cube type of mixer, 1.5cube pattern type of mixer, 2 cube type of mixer and 3 cube type of concrete mixer. JS concrete mixer has the advantage of high output, low power consumption, and low carbon. If you want to know more information about the mixer or buy it, you can contact us. We will try our best to service for you.